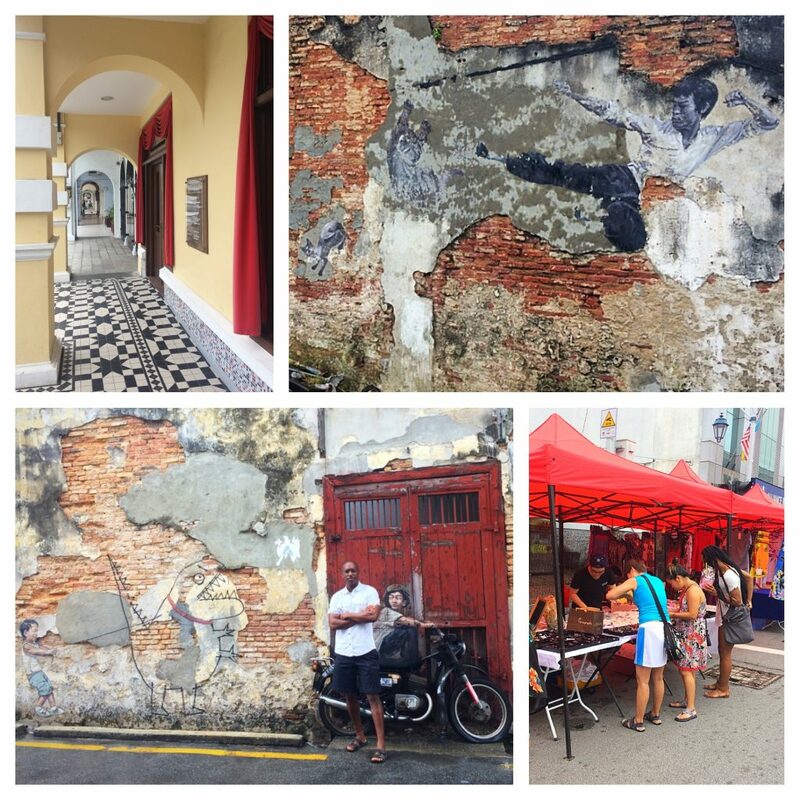 Much like the street art and street (“hawker”) food that seem to serve as the first definition of modern day Penang, the city is one that is best experienced through the senses. 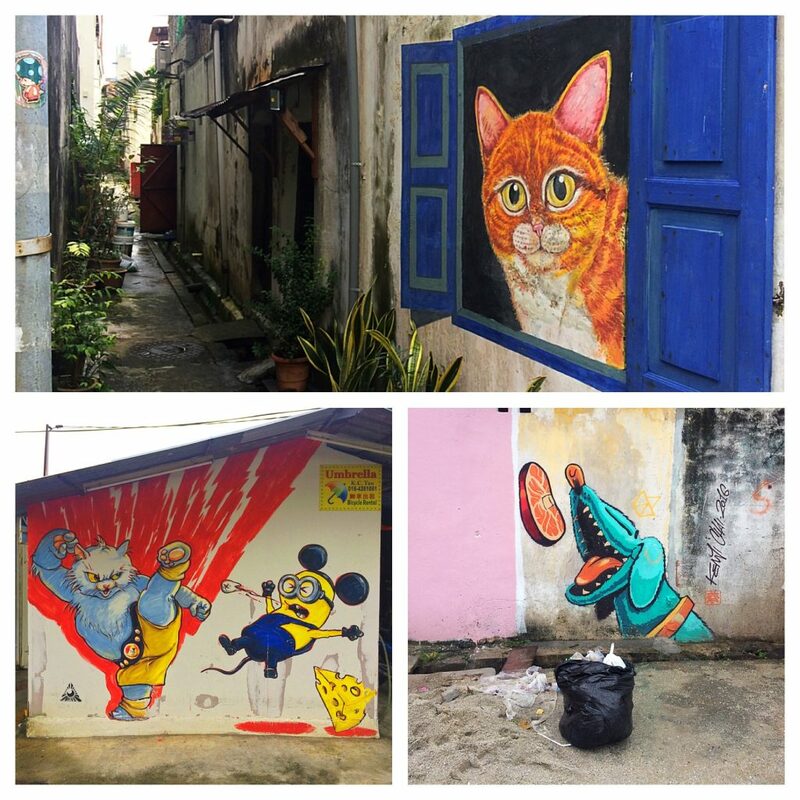 Though the city is still trying to create an identity for itself after it was stripped of such comfort during WWII, it is using vibrant, creative solutions to tell its history, share its beauty and humor, and redevelop itself as Malaysia’s thriving second city. 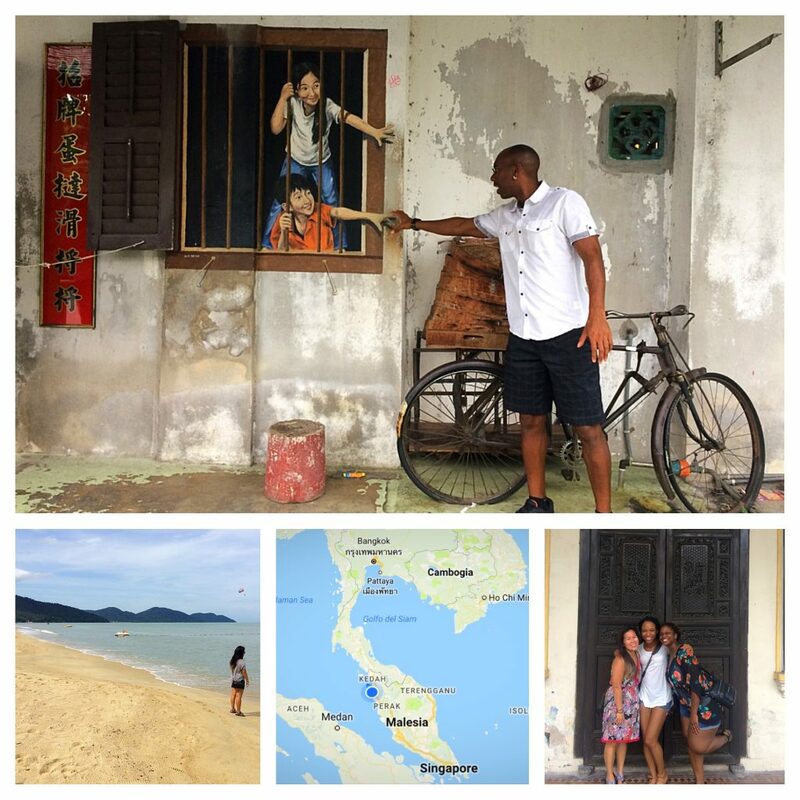 Penang (more specifically, George Town, the state’s capital city) was on our short list for options as a potential home base during our time in South East Asia. Given that we were planning to leave Chiang Mai in February prior to the “burning season”, we looked at George Town as option before heading to Vietnam in March. So the trip was both a scouting trip, as well as the minor piece of a 3-city tour with my cousin and her friend visiting Asia for the first time from the States. Surprises aren’t necessarily a common event in my family but when they happen, they are incredibly meaningful. For instance, back in 2009, I coordinated a surprise for my aunt during her law school graduation in Los Angeles. My mom and my cousin (Angela) flew in from the Midwest and we worked out a perfect surprise on the streets of LA. (I would post the picture but my aunt might not talk to me again ). Later that same year, I surprised my Dad for Father’s Day by flying home from California, knocking on his door, and presenting him with a self-published book detailing our collective experiences as pilots. Earlier this year, my cousin Angela tried to coordinate a surprise for me during our visit to Charleston by flying in unexpectedly from Houston, yet my mom dropped the ball and let it slip that she was coming. While I wasn’t surprised, I was very honored and appreciative of her impromptu visit. So when Angela and her roommate decided to spend the first part of their hectic 8-day, 3-city, 2-country tour in South East Asia, I decided to try to surprise her by visiting them in Bangkok before our planned meet up on the way to Penang. 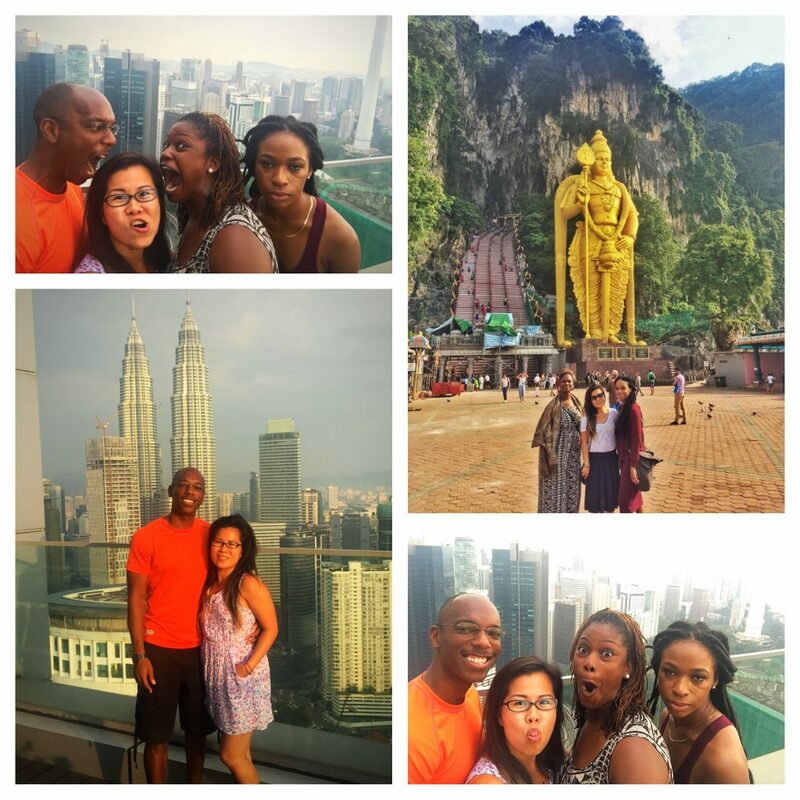 Fate and fortune worked out perfectly, as Danita (her friend) and I were able to coordinate a surprise just minutes after I arrived in Bangkok. A picture may speak a thousand words but a video surely speaks a million. 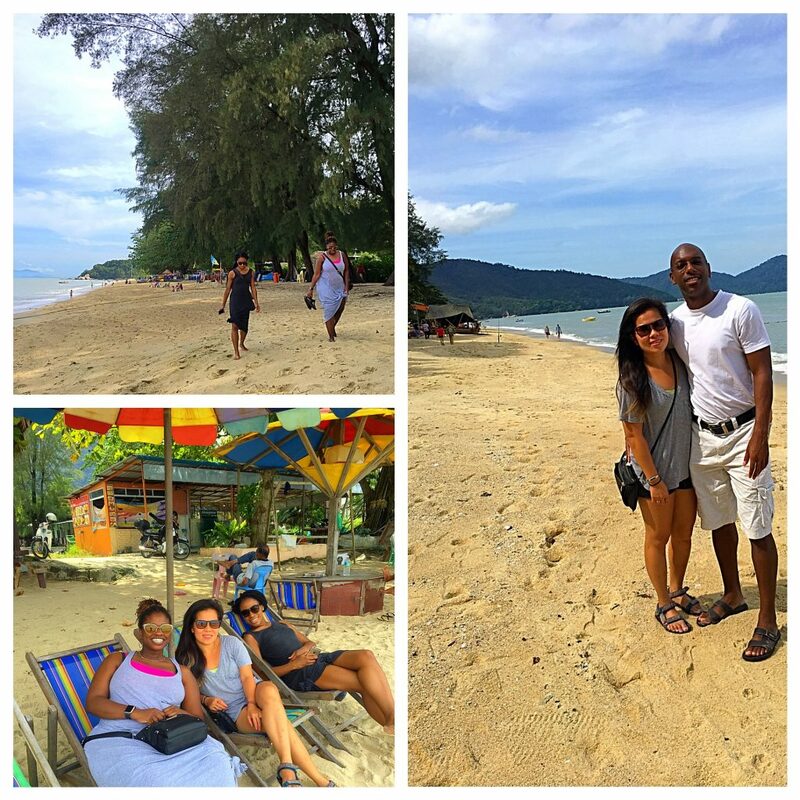 Our brief 48 hours together in Bangkok was fast but worth it. I tend to describe visiting Bangkok as a mix between Los Angeles (ridiculous urban sprawl and crazy traffic) and Las Vegas (for obvious reasons). So like many Bangkok newbies, they were ready to leave after just two days and head down to the quieter confines of Penang. 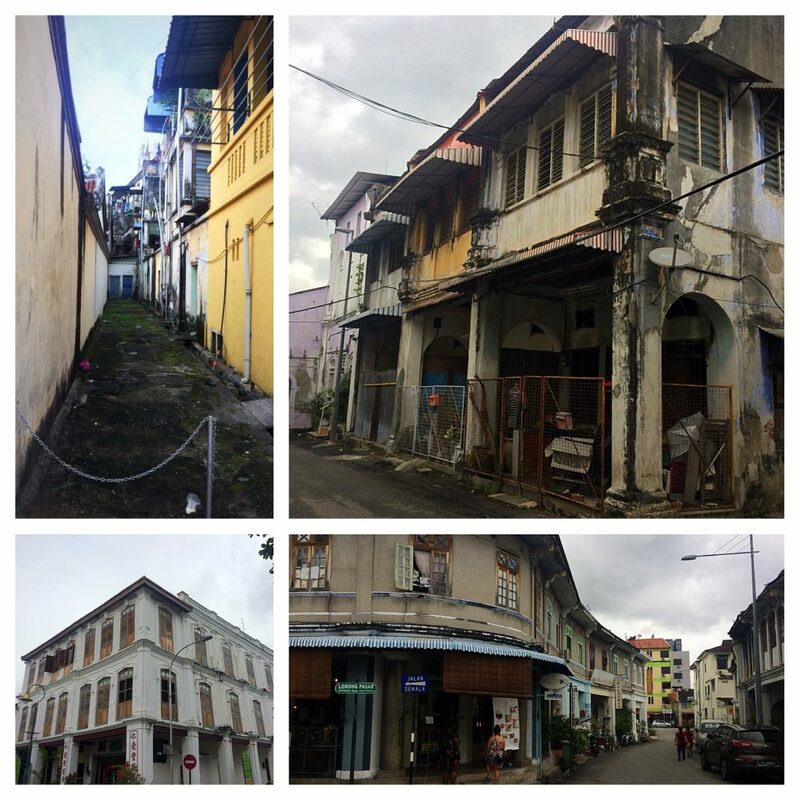 While Penang has a history much like the rest of colonial South East Asia, the way in which it has emerged from that past is truly unique. Given its geographical location, the area was a prominent military and trading post during the British imperial reign, especially during the height of the infamous British East India Company. However, things changed dramatically on Dec 19, 1941, when Japanese forces unleashed heavy bombing on the city – causing the British to surrender the area and flee south to Singapore. During the next two and half years, the Japanese moved in and annihilated the population, more specifically, Chinese residents. Once as the Allied Forces regained a foothold in the region, they then added to the destruction by re-bombing the city, almost into complete dissolution. These relentless bombing periods destroyed many of the historical records in George Town and made it difficult to piece together the history of the area prior to WWII period. Similar to history of most of pre-WWII colonial South East Asia, after the war the prestige and aura of the British Empire was tarnished, as were their wallets. They simply couldn’t stop the tide of independence sweeping through South East Asia. In 1963, Malaysia became an independent nation, thereby granting independence to the state of Penang. Forty-five years later, in 2008, Penang gained status as a UNESCO World Heritage Site, finally protecting the pre-war landscape from demolition and urban renewal. Similar to Casco Viejo (Panama City) and Old San Juan (Puerto Rico), George Town is one of the few relics of the colonial period left for the world to explore and understand. And the city has done a remarkable job of creating beauty out of destruction by commissioning artists to tell its history using its streets and surfaces as the canvas. Penang is best experienced through the senses. Having been named the Best Street Food in Asia by Time Magazine in 2004, the city has emerged as a top travel destination for foodies and urban trekkers throughout the region. While it is an island and does have beaches, the real joy of experiencing it lies within its aging concrete jungle. There are more than 160+ art installations across the city organized into two key themes. One, simply known as Street Art, is a collection of murals that dot the cities streets and alleyways, guiding tourists on a walking art exhibition throughout the dilapidated ruins of the old city. 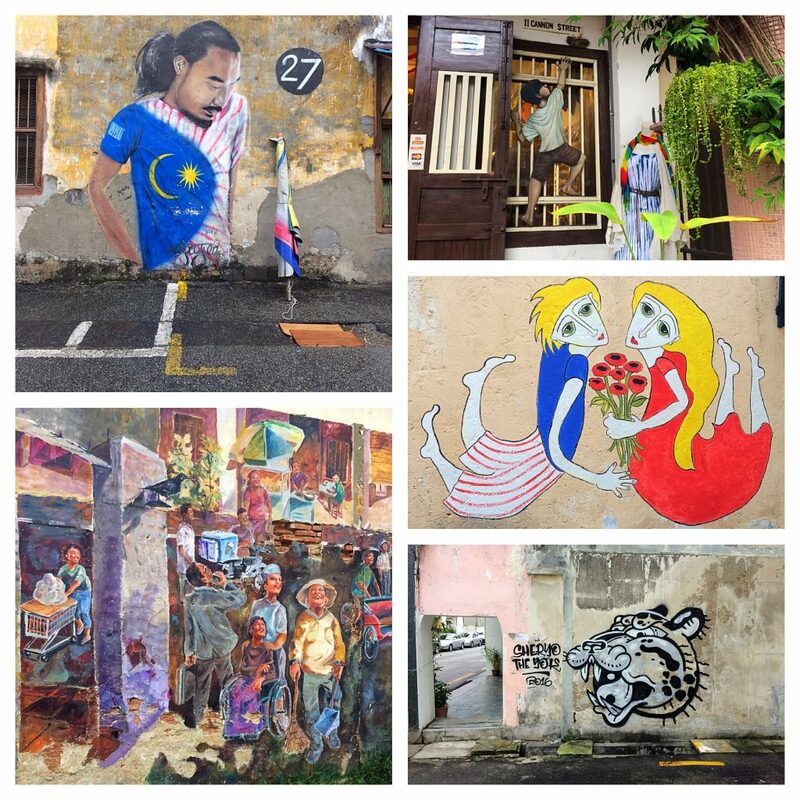 Started in 2012 with just 6 murals as a part of the George Town Festival of Arts and Culture, the “exhibit” now consists of more than 110+ works. What’s most impressive is the use of facades and real-life props that make the artwork come alive. In many cases, you feel as though you’re sharing the experience of the artwork with the characters in the pieces and with relics of a bygone era. The other, more strategic and symbolic exhibit, named “Marking George Town” was commissioned a few years earlier as a way to “physically brand George Town as a UNESCO World Heritage Site.” These 52 iron rod sculptures provide a humorous, yet educational walking history tour of the old city. 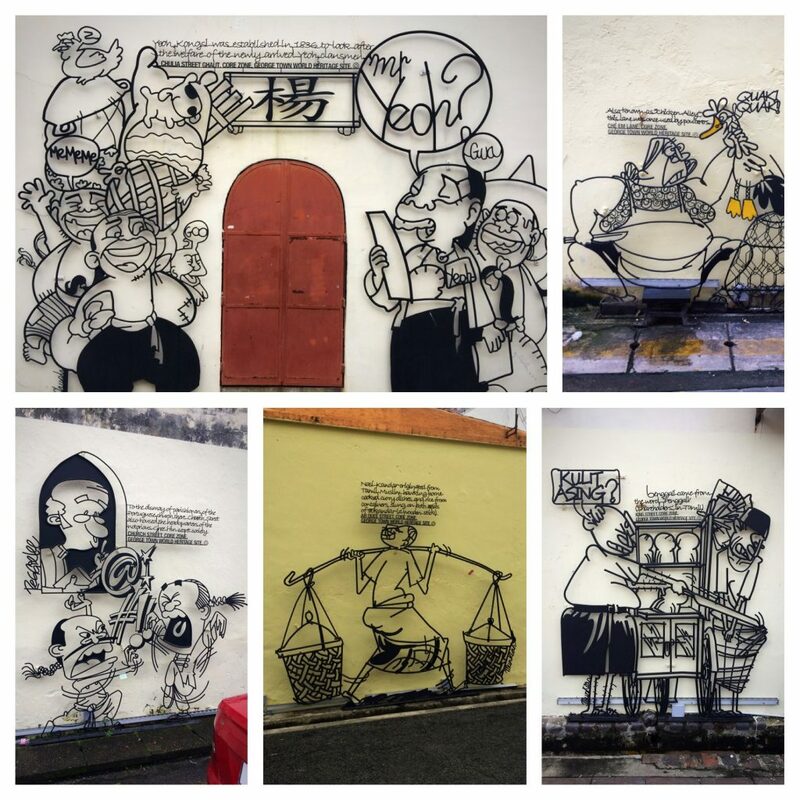 Even if you never visit Penang physically, you can learn about its storied history simply by perusing the Penang State Government blog to view images of each installation. Given our brief trip to the area (just two full days book-ended by two travel days), we made it a point to use one day to explore the street scene and the other day to enjoy relaxing on the beach. Hawker food is a major attraction in Penang, yet given that we’d been living in Thailand for 3 months already, much of the street food was pretty standard for us – good but also standard. If one has never been to South East Asia and is looking for a great place to sample tons of cheap, local fare with an amazing wide range of variety (Chinese, Malaysian, Southern Indian, etc. ), Penang will not disappoint. 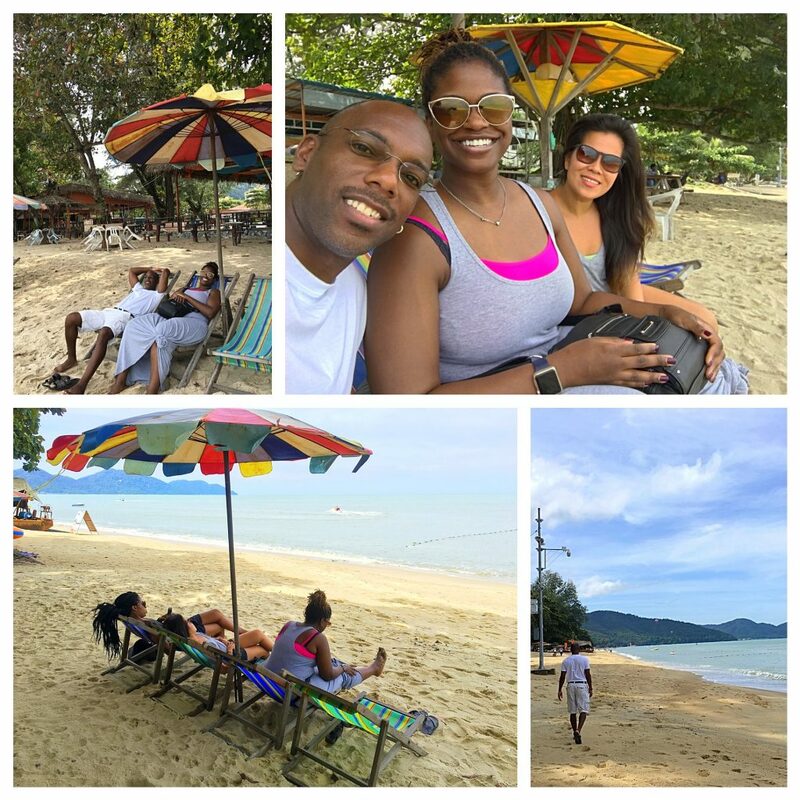 We spent our last full day in Penang visiting its most popular beach area – Batu Ferringhi. Located just about 30 minutes outside of the George Town, it makes for a great, quick getaway during a brief stay in the area. Though as we arrived in the late-morning hours, I quickly found myself in need of a backup plan, as most of the local eateries hadn’t yet opened and I had three hot and “hangry” ladies in tow. Thankfully, we found a beach side resort to dip into right at the end of their morning buffet. What originally looked like bad start to a beach day getaway, soon evolved into the most relaxing day of our entire trip. Yet what began to concern me during our stay in Penang (and eventually in Kuala Lumpur) were the seemingly ridiculous low rates we were being charged for our Uber rides around town. Having lived in the heart of Silicon Valley, my sensitivity to “creative disruption” has been heightened for years. Being in South East Asia and witnessing the expansion of the “gig economy” in these regions begins to raise a series of doubts and questions for me. For instance, most of our Uber rides cost around $1 – $5 for trips ranging from 5-10 minutes to sometimes nearly 1 hour. And while I understand the dynamics of the value of foreign and domestic currencies, what is not lost on me is the long-term game in which Uber is playing to achieve its strategic objectives. Let’s not forget, it’s still a company that is valued at over $60 Billion but is losing nearly a billion dollars a quarter. It’s quite evident that their long-term goal is not to create meaningful side gigs for the lower to middle classes but rather to create enough pull in local markets with middle to high income earners, such that once they achieve the ability to provide services with purely autonomous vehicles, they will gut their “labor” costs and drive more and more dollars from local markets into the hands of sovereign wealth funds and the handsomely rich global elites – essentially using robots. In a veiled attempt to show a drive towards profitability (simply to achieve the goals of its latest funding round), the company lowered fares and increased commissions in many of its markets. So now, drivers are being charged more to perform their services while customers are paying less. All the while, 20-30% of the fees charged by Uber are inevitably working their way out of the local economies where they operate and back into the pockets of wealthy investors. Uber (and many of its competitors’) long-term play is not lost on me and obviously not something I’ll be able to address individually. However, I think it’s important to recognize the subtle changes in markets and economies that have drastic impacts over time. Similar to the trading posts established during the British imperial reign, what may be seen as adding to the local economy and creating opportunity, may simply end up being a cash grab of the highest order by those with already more wealth and means. Yet in this day in age, rather than using technology to enhance the long-term economic prospects of a region, history is repeating itself as those with wealth continue to identify opportunities to bleed more riches from those in less fortunate economic circumstances. In a crazy twist of irony, Bloomberg released an episode of their Decrypted podcast (“Here is the Untold Story of One of Uber’s Very First Drivers“) the day after I wrote this blog post highlighting many of the same issues I laid out above. It’s a fascinating listen for those interested in diving further into this issue. 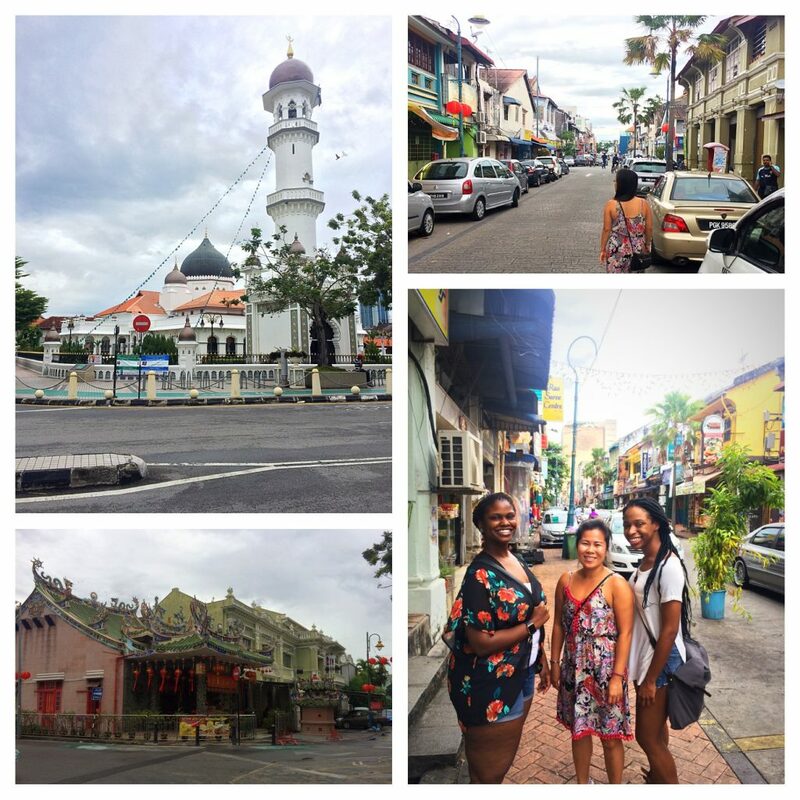 As we arrived in Kuala Lumpur after our brief stay in Penang, we were quickly reminded how comfortable we feel in this big city with a small town feel. 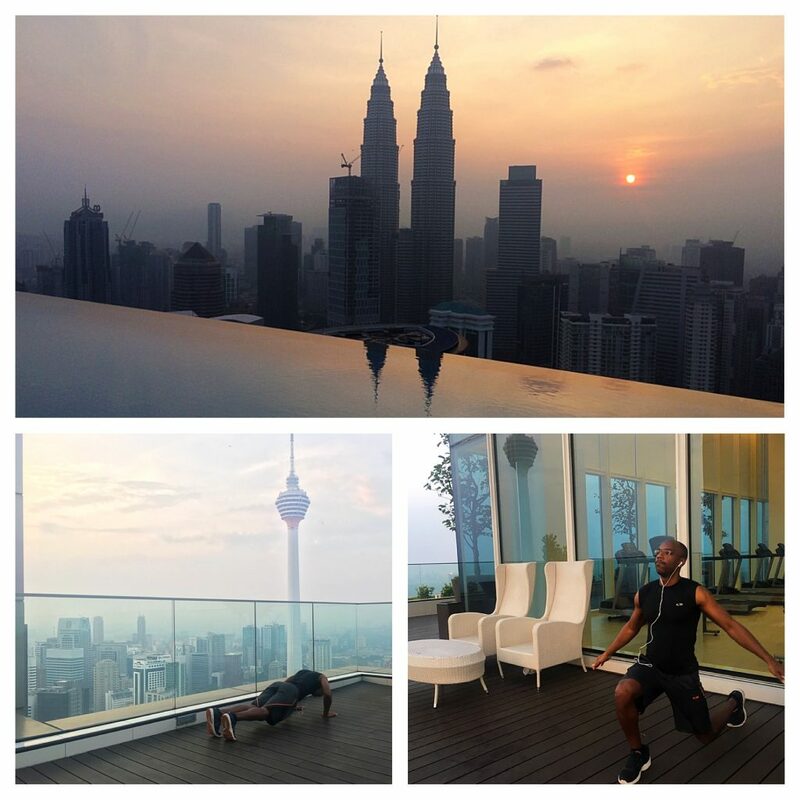 So long as you aren’t stuck in a car, Kuala Lumpur (KL) is a seemingly very comfortable place. It didn’t hurt that we also stayed at one of nicest and newest luxury residences in downtown for just $80/night. 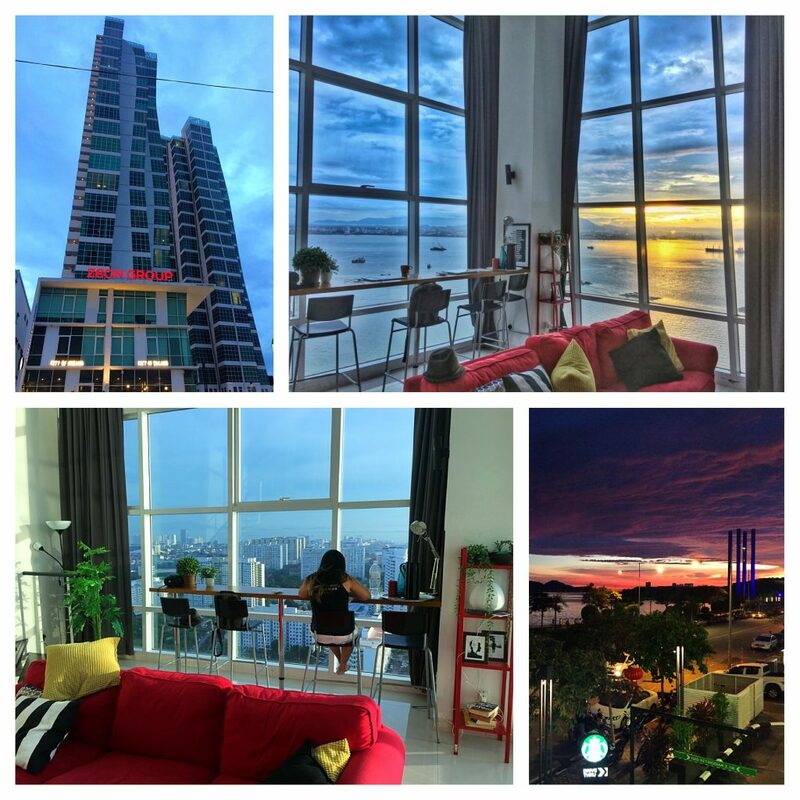 For short-term stays, KL has some really affordable luxury options through Airbnb that make it a great short-term hub for long-term travelers through South East Asia. 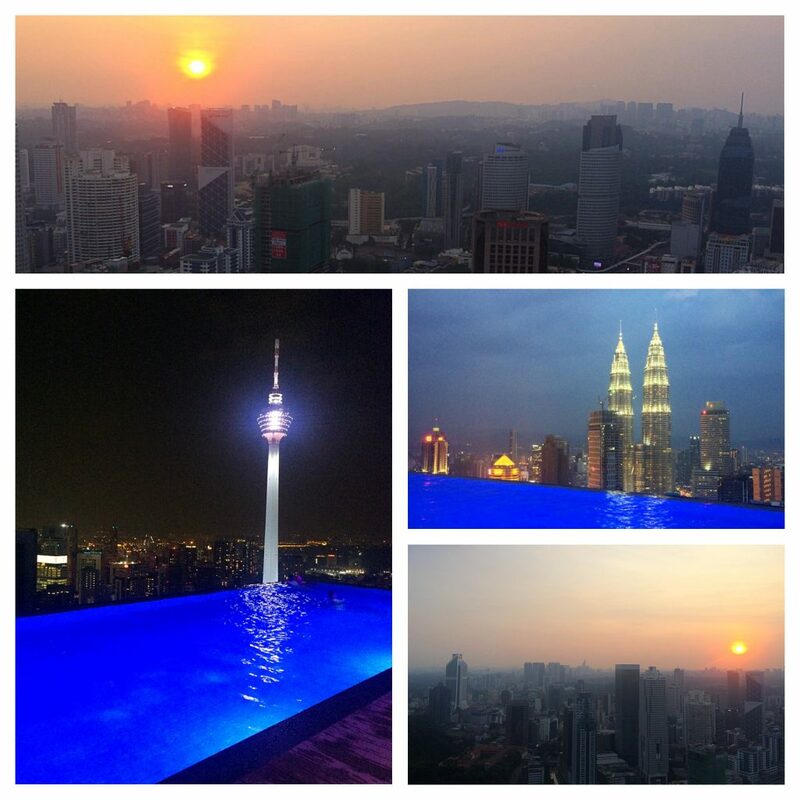 It didn’t take long for us to decide that we’d prefer spend our next month in Kuala Lumpur rather than Penang. 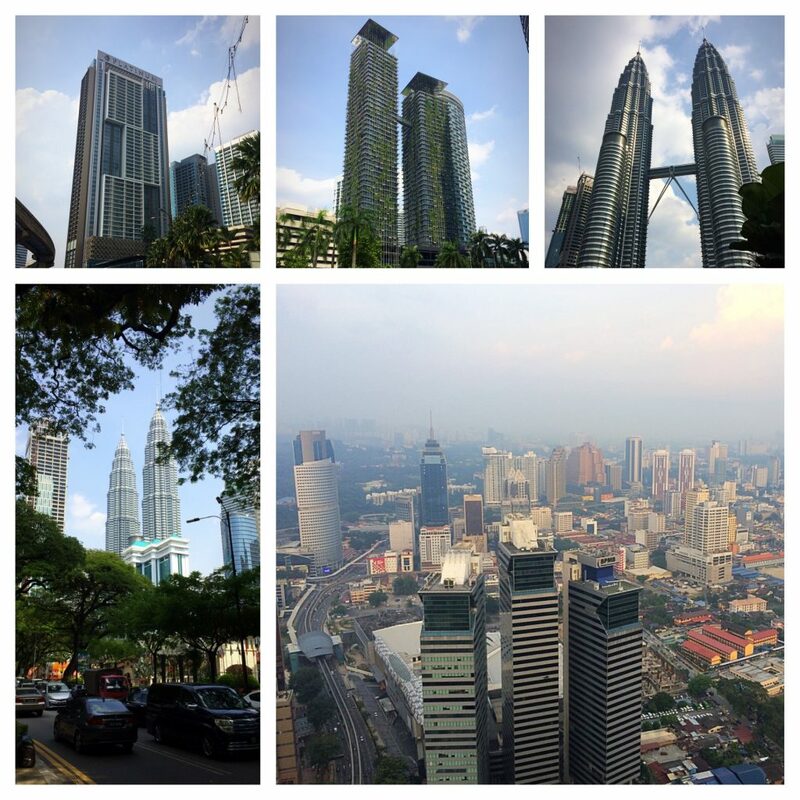 Given that it was our second time in Kuala Lumpur, it started to feel like another “home away from home”, especially now that we were unofficial tour guides and hosts for our first-time Asia travelers in tow. We couldn’t have asked for a better way to end an action-packed and fun-filled week-long trip. There’s nothing like having loved ones from home visit us during this experience. It not only adds a unique piece to the puzzle of our collective life experiences but it helps give us the balance we crave being in lands so far away. 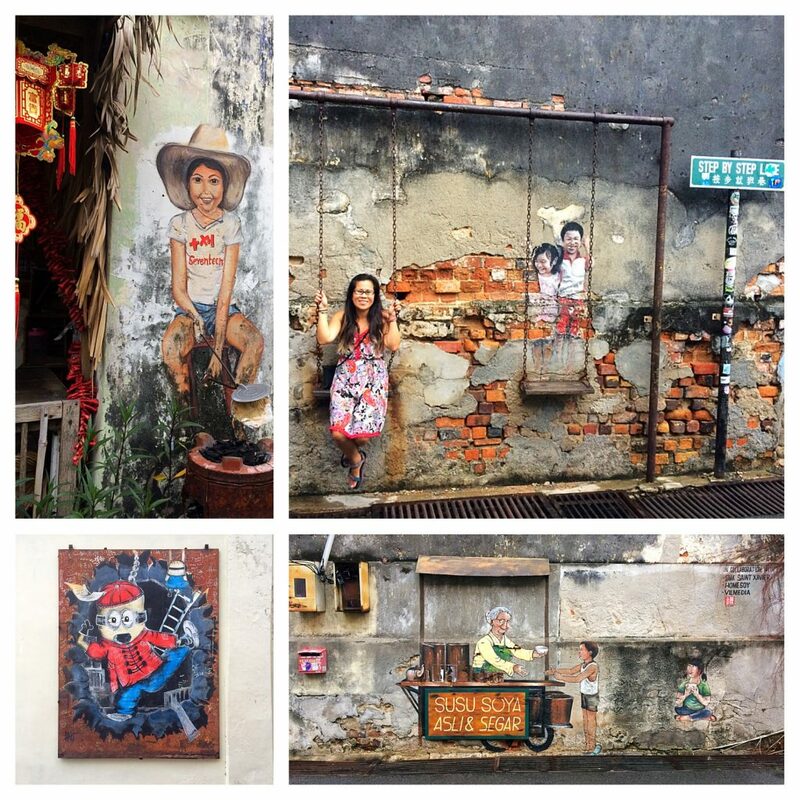 Love Georgetown’s street art and the street food is unbeatable!